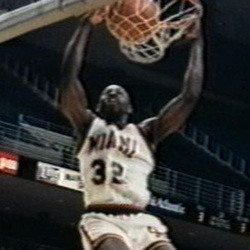 Few players have had the impact on a sport at Miami that Eric Brown did during the resurrection of Miami's men's basketball program from 1985-89. When Miami resumed play in men's basketball in 1985, after a 14-year hiatus, Brown was the key player for the Hurricanes - a role he continued to fill throughout his UM career. Brown led the Hurricanes in scoring throughout his UM career, in addition to leading UM in steals one year and in rebounds in two seasons. The second-leading scorer in UM history, with 2,270 points, Brown holds UM career records for field goal percentage (.535) and free throw attempts (840). He remains a prominent member of the UM record book, ranking among the all-time leaders in field goals made in a season (255), free throws made (246) and free throws attempted (310). Eric was named an ACC Legend in 2011. He was inducted into the University of Miami Sports Hall of Fame in 2001.